A straightforward writing style ensures students understand difficult concepts and complex procedures in the microbiology lab. The exercises emphasize the medical applications of microbiology for nursing and other allied health majors, with an experimental research theme interwoven throughout. Discussion questions become more challenging as the course progresses, requiring more critical thinking from students. 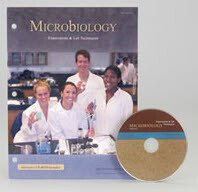 Included is a CD-ROM supplement version 5.0 (Windows®/Macintosh® compatible) with 5 computer programs for student usage. Shrink-wrapped manual has predrilled holes for a 3-ring binder (not included). Soft cover.